Contrary to the message that television programs like American Idol and The Voice deliver, the best vocalists are not always those with a multi-octave range or the power to rip the roof off a concert hall. The most gifted vocalists use control, tone, dynamics, nuance and most importantly, authenticity, in service of the song. Their vocal matches if not sets the song's mood, and supports it just enough, so that what lingers in memory is the song as a united whole, not the artist’s vocal acrobatics. 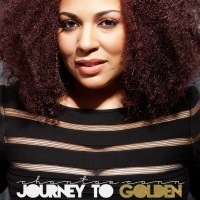 With her exquisite new album Journey to Golden, singer/songwriter Chantae Cann demonstrates her mastery of the art of expressive, subtle singing that places the song front and center. T.S. Eliot wrote that "April is the cruelest month," and while I love Eliot's poetry, I've never agreed with him on that point. What this album calls most to mind are the beauty and promise of April: The opening of flowers, the ripening of nature, the increasing, gentle warmth of the breeze. Producer Jamie Portee, who also ably serves as a pianist and vocalist on the record, creates a stunningly beautiful, jazzy soul soundscape to accompany Ms. Cann on her journey. Amid guest appearances by the stellar musicians of Snarky Puppy and string arrangements by Melvin “Maestro” Lightford that are so lovely they defy adequate description, Ms. Cann offers the listener a wide palette of vocal flavors and textures, all comforting and “just right” for the song at hand. On the first half of the album, beginning with the delightful opener “Da Da’n Da,” Ms. Cann is soft and breathy, resting ever so lightly atop the rich, repeating piano motifs that anchor the tracks; with her song aptly titled “iChange,” a striking duet with Portee, she indeed begins to change it up, with traces of hip hop evident in her phrasing, and on the next track, “Free Your Dreams,” she shows her skill at powering hip shakin’ R&B. On every track, she and her supporting musicians -- all playing real instruments with no added studio gimmickry -- work seamlessly to build something authentic and memorable. Journey to Golden is not simply a collection of great songs, it’s an artistic expression that transports you somewhere. The well-placed instrumental interludes are in part responsible for the album’s sense of forward movement, like ripples in a cool stream, and the glorious final instrumental, “For The Children,” made me want to say “thank you” directly to the artist for creating something that graceful. SoulTrackers, give this full record an uninterrupted listen. It’s easily a “Best of 2016” selection and, you heard it here first, a clear Grammy contender for Best Jazz Vocal Album. Yes, it’s just that good. Highly Recommended.